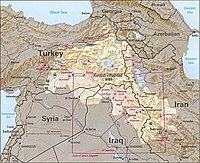 Kurdistan ( (listen) (help·info) "Laund o the Kurds"; an aa umwhile spelled Curdistan; auncient name: Corduene) is a roughly defined geo-cultural region whaurin the Kurdish fowk furm a prominent majority population, an Kurdish cultur, leid, an naitional identity hae historically been based. Contemporary uise o Kurdistan refers tae lairge pairts o eastren Turkey (Turkish Kurdistan), northren Iraq (Iraqi Kurdistan), northwastren Iran (Iranian Kurdistan) an northeastren Sirie (Wastren Kurdistan) inhabitit mainly bi Kurds. Kurdistan roughly encompasses the northwastren Zagros an the eastren Taurus muntain ranges, an covers smaa portions o Armenie. This page wis last eeditit on 30 Dizember 2013, at 20:20.